This review is about a binary options scam called “Binary Freedom Formula”. It has an anonymous video presentation. The man speaking in the video says that he cannot reveal his identity, but he supposedly is a hacker that is testing software of the biggest companies. He says that one day he discovered a bug a in a banking system that allowed him to create an algorithm that can trade financial markets. This algorithm is now incorporated in the Binary Freedom Formula app that you can get for free. It supposedly has a 93.9 % winning ratio and can make you $1,300 per day or $39,000 per month. People who know something about trading will immediately recognize a scam when they see a claim about a 93.9 % winning ratio on binary options. Because it is impossible to win that much. The favourite app of scammers. But there are other proofs, such as fake testimonials with paid actors in the video or the claim about limited spots. In fact it will be open forever. 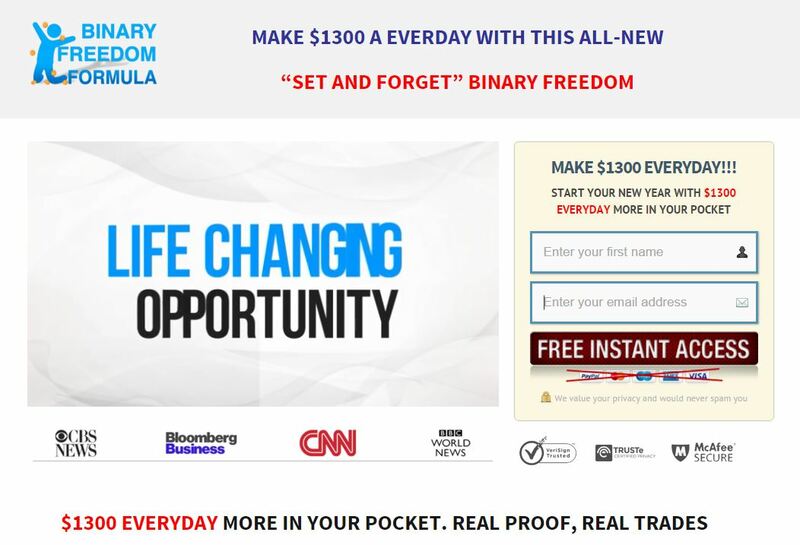 But the best proof is that the Binary Freedom Formula uses exactly the same app as many other known binary options scam, like Medallion or Centument. Only the logo and colours change. Finally we should also mention that this app is not free. Because in order to get access to the Binary Freedom Formula you will have to open a trading account and deposit $250 at least. This is what you will be risking and this is what you will lose. And this is also what will make these scammers earn an affiliate commission with their broker, which is the only purpose of Binary Freedom Formula. 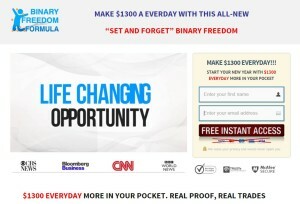 Binary Freedom Formula is an ordinary scam that is sponging on binary options. If you really want to make money on binary options, try a free demo and build a profitable strategy that you will trade manually, it is the only reliable way.